My mother, who passed into the next plane of her existence on June 13th, 2017, exemplified the kind of selfless service to others that always creates an enormous source of love. On that day, I lost my mom—and I truly believe the world lost a special, pure soul who had nothing but kindness for anyone who crossed her path. Her father’s name was Hasan, known to people as Hasan Bazaz, meaning “the fabric seller.” He was one of the early Baha’is of Azerbaijan, and had met Abdu’l-Baha. Her mother, Fatimeh, was a new Baha’i. To sell his cloth, Hasan used to take many business trips to places as far away as Ashgabat; his last trip took him to the village of Seisan, Iran, which had a majority population of Baha’is. Hasan died on that trip—when my mother was only six years old—and the circumstances of his death are still not clear. We never knew if his death was intentional, one of the many Baha’is persecuted and killed by fanatical Iranians. My grandfather was a devoted Baha’i. After this tragedy, Mahboobeh’s newly-widowed young mother bore the pain of raising her children on her own, not an easy task in 1939 Iran for a single woman—especially when considering the fact that World War II was about to start, and Azerbaijan was about to be occupied by the Soviet Forces. As a young girl, Mahboobeh became interested in the nursing profession after her mom fell ill and was admitted to the American Hospital in Tabriz. The nurse attending to Mahboobeh’s mom did not let her in to see her, saying she was too young. On that day, my mother decided that once she was old enough, she would become a nurse, get one of those white hats and let in all of the kids who want to visit someone they love. Once she was old enough, that’s exactly what she did. She went to work at a hospital in Tehran that belonged to Baha’is, and worked any and all jobs there until she at last became a nurse responsible for the surgery room, assisting surgeons. She loved her job, and worked in that hospital for 10 years. The experience shaped her life, and her love for service blossomed for decades to come. 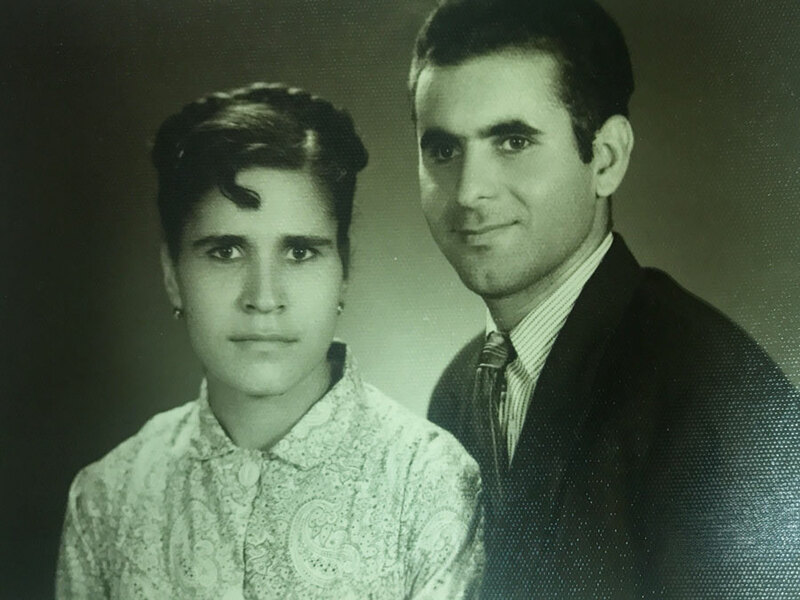 In 1961, she married Abdul Hussein Zamani, the love of her life—and my future father. Abdul had recently become a Baha’i. He learned about the Faith from Mr. Majzub and Mr. Bakhtavar, who were both executed a few years later by the Iranian government for no crime but being Baha’is. My parents met in another hospital where Abdul worked, which she had come to visit, introduced by a mutual friend who was a physician at both hospitals. She gave birth to their first child, Ahdieh, and quit her nursing work to take care of her new daughter full time. Soon their second child Farhang joined the family. Newly married Mahboobeh and her husband Abdul Hussein Zamani in 1961. In 1969, the family moved to a small Iranian town named Karaj. I was born then, the youngest of my parent’s three children. Because my mother and father wanted to carry the Baha’i message of the oneness of humanity to others, we lived in a series of small Iranian towns—where some inhabitants proved to be very cruel to our young Baha’i family. City life would have been much easier, where Baha’is were less likely to be subject to such persecution, but my parents had a passion for serving others. Often local stores would refuse to sell us basic essentials because of the hatred the proprietors had towards Baha’is. Routinely, my sister Ahdieh and my brother Farhang would get beaten up by other kids for being Baha’is. Often at night rocks were thrown at our windows—which meant we constantly cleaned up broken glass. Our lives were constantly in danger for many years, and no legal authority was willing to offer any support or protection. My parents decided to leave Iran when I was five, and we lived, for less than a year, in a town in India where they were able to further share the Baha’i message. We loved India, but it didn’t last long for us—my father wouldn’t pay the bribes officials demanded for our visas, so we were forced to return to Iran. At one point the persecution in Iran got so bad that I was almost killed by a mob. Expelled from school as an 11-year-old when I was attending 6thgrade, the school administration had decided that they wanted to cleanse the school of all Baha’is. I barely escaped. A few years later my mother and father made the decision to begin getting their children out of Iran. Since the Iranian government wouldn’t give Baha’is passports, that involved smugglers and the very real possibility of not surviving the journey. First, Farhang and Ahdieh and her family fled from Iran to Pakistan, in hopes of a better life. A year later, when I was only 16, I escaped through the desert as well. My parents later followed their three children, without passports and with the help of smugglers. For a few years the family was spread across different continents until we reunited in California in 1990. After arriving in California, finally free of the vicious persecution of their homeland, Mahboobeh and Abdul traveled to their favorite country, India—and to Switzerland, Britain, France, Costa Rica, Mexico, Canada, Singapore and Australia. They could finally be the world citizens they dreamed of being. My mother didn’t stop helping other people, though. She volunteered at hospitals and retirement homes, at Baha’i conferences, volunteered to clean highways, and took care of children and grandchildren. She was happy. She would break into song at any random moment; dance freely when she heard music; and smile broadly constantly. … the true Baha’i loves the children, because Jesus says they are of the Kingdom of heaven. A simple pure heart is near to God; a child has no worldly ambitions. – Abdu’l-Baha, Abdu’l-Baha in London, p. 59. That one indeed is a man who, today, dedicateth himself to the service of the entire human race. The Great Being saith: Blessed and happy is he that ariseth to promote the best interests of the peoples and kindreds of the earth. In another passage He hath proclaimed: It is not for him to pride himself who loveth his own country, but rather for him who loveth the whole world. The earth is but one country, and mankind its citizens. – Baha’u’llah, Gleanings from the Writings of Baha’u’llah, p. 250. My mother knew she was dying, but she faced that coming transformation with great joy. About five and half years ago, my mother Mahboobeh first felt that there was an issue with her heart; It turned out that she had a congestive heart failure and atrial fibrillation. Last year, on the day she was packed and ready to travel to Chicago for an annual Baha’i conference, she was diagnosed with stage 4 lymphoma. O Son of Spirit! With the joyful tidings of light I hail thee: rejoice! To the court of holiness I summon thee; abide therein that thou mayest live in peace for evermore. O Son of Spirit! The spirit of holiness beareth unto thee the joyful tidings of reunion; wherefore dost thou grieve? The spirit of power confirmeth thee in His cause; why dost thou veil thyself? The light of His countenance doth lead thee; how canst thou go astray? – Baha’u’llah, The Hidden Words, pp. 11-12. Here is my mom during one hospital visit a few months ago singing for a few of her grandchildren. She is singing in Turkish and Farsi, but one cannot ignore her joy! Up until the very last day of her life, she had that familiar happy smile on her face. We went for a hike together just a week before she passed into the next world, and I took a photo of her. She knew she was ill; she knew she didn’t have much time left; but the radiance of her smile in that photo testifies to the pure joy in her heart. Even at her advanced age, she still had all of her wonderful qualities—despite the pain and suffering she went through in life, and despite growing up without a father, she was resilient, strong and determined. She had a powerful will and she persevered no matter what, which meant she accomplished whatever she set her mind and heart on. She loved children, and she loved anyone who had struggled in life—as a Baha’i she had a soft spot for any minority, having been a persecuted minority herself. She rose up into the shadowing mercy of God and was plunged in an ocean of light. Unto her be salutations and praise, compassion and glory. May God make sweet her resting-place with the outpourings of His heavenly mercy … – Abdu’l-Baha, Memorials of the Faithful, p. 175. After her passing, we received more than a thousand consoling messages from family, friends and even people we didn’t know—but who knew her. Reading them all, I realized they described the same characteristics and qualities over and over: joyful, resilient, always happy, energetic, determined, selfless, never focused on her pains and always focused on others. Lots of those people who sent us messages expressed shock and surprise that she had died, because many didn’t even know she was sick. Hundreds of those messages fondly remembered her giving nature. She freely gave of her time and energy to those she loved—and to complete strangers, as well. She always had small gifts with her for any child she would run into. She loved gardening and making living things grow. Every day she went out to the garden and said prayers for the healthy growth of her plants, and did so one last time just two days before her passing. She always taught the spiritual principles of the Baha’i Faith in her actions, and stood for justice for others—many villagers in Iran will testify to that. She was a true feminist, who worked shoulder to shoulder with her brethren in the remote places of Iran, and took on tasks few women in those days would dare to take on. She was a constant source of unity for her family, and the best encourager I ever had. Every day she left me loving, encouraging phone messages, all of them about 15 seconds long. She didn’t want anything, but rather just wanted me to know that she loved me and that as a mom she was happy with me. She did not leave behind much in material inheritance, but she certainly added to the happiness of whoever she encountered. Even though the impact may have been slight, there is no question that the world is better off because of the time she spent on this planet. She lived a modest but powerfully spiritual life, despite all of the tests, difficulties and challenges she faced. She was my hero. I hope you will join me and the rest of my family in remembering her and offering prayers for the continual progress of her dear soul. Funeral of Mahboobeh Zamani June 17, 2017. © 2019 - All Rights Reserved - One Planet Ops Inc.